The human integumentary system is made up of the skin, hair, nails, and associated glands. Its main function is to protect the body. It prevents excessive water loss, keeps out microorganisms that could cause illness, and shields the underlying tissues from external damage. The skin helps to regulate body temperature. If heat builds up in the body, sweat glands in the skin produce sweat, which evaporates and cools the skin. When the body overheats, blood vessels in the skin expand and bring more warm blood to the surface, where it cools. When the body gets too cold, the blood vessels in the skin contract, leaving less blood at the body surface, and its heat is conserved. In addition to temperature regulation, the skin serves as a minor excretory organ. Sweat removes small amounts of wastes produced by the body. These wastes include salts and urea (a chemical compound of carbon, hydrogen, nitrogen, and oxygen). The skin also functions as a sense organ since it contains millions of nerve endings that detect heat, cold, pain, and pressure. Finally, the skin produces vitamin D in the presence of sunlight and renews and repairs damage to itself. In an adult, the skin covers about 21.5 square feet (2 square meters), and weighs about 11 pounds (5 kilograms). Depending on location, the skin ranges from 0.02 to 0.16 inch (0.5 to 4.0 millimeters) thick. Its two principal parts are the epidermis (the outer layer) and dermis (thicker inner layer). A subcutaneous (under the skin) layer of adipose or fatty tissue is found below the dermis. Fibers from the dermis attach the skin to the subcutaneous layer, and the underlying tissues and organs also connect to the subcutaneous layer. Ninety percent of the epidermis, including the outer layers, contain cells that produce keratin, a protein that helps waterproof and protect the skin. Keratin is also the major protein found in nails and hair. Pigment cells called melanocytes produce melanin, a brown-black pigment that gives color to the skin and absorbs and reflects the Sun's harmful ultraviolet rays. Calluses: Abnormal thickenings of the epidermis. Dermis: Thicker layer of skin lying below the epidermis. Epidermis: Thinner outermost layer of the skin. Keratin: Insoluble protein found in hair, nails, and skin. Melanin: Brown-black pigment found in skin and hair. Subcutaneous layer: Layer of fatty tissue found beneath the skin. 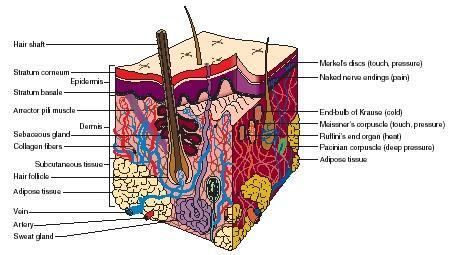 In most areas of the body, the epidermis consists of four layers. The epidermis on the soles of the feet and palms of the hands has five layers, since these areas receive a lot of friction. Calluses, abnormal thickenings of the epidermis, can occur on any area of the skin where there is irritation or constant pressure. The uppermost layer of the epidermis consists of about 25 rows of flat dead cells that contain keratin. At the skin surface, dead cells are constantly shed. The dermis is thick in the palms and soles, but very thin in other places, such as the eyelids. The dermis is composed of connective tissue that contains protein fibers (called collagen) and elastic fibers. It also contains blood and lymph vessels, sensory nerves, and glands. Sweat glands are embedded in the deep layers of the dermis. Their ducts pass through the epidermis to the outside and open on the skin surface through pores. Hair and hair roots also originate in the dermis. Hair shafts (containing the bulb of hair) extend from the hair root through the skin layers to the surface. Attached to the hair shaft is a sebaceous gland, which produces an oily substance called sebum. Sebum softens the hair and prevents it from drying. If sebum blocks up a sebaceous gland, a whitehead appears on the skin. A blackhead results if the material oxidizes and dries. Acne is caused by infections of the sebaceous glands. When this occurs, the skin breaks out in pimples and can become scarred. Nerves in the dermis carry impulses to and from hair muscles, sweat glands, and blood vessels. Bare nerve endings throughout the skin report information to the brain about temperature change (both heat and cold), pressure, and pain. Some skin disorders result from overexposure to the ultraviolet (UV) rays in sunlight. UV rays damage skin cells, blood vessels, and other dermal structures. At first, overexposure to sunlight results in injury known as sunburn. Continual overexposure leads to leathery skin, wrinkles, and discoloration. It can eventually lead to skin cancer, regardless of the amount of melanin in the epidermis. There can be a 10- to 20-year delay between exposure to sunlight and the development of skin cancer. omg..thank u so much. that info helped me a+ my science project. loove u all.thanks so much. bye!